Lovely shot, isn't it? I was trying so hard to find a great Christmas pic to use and came across this one. 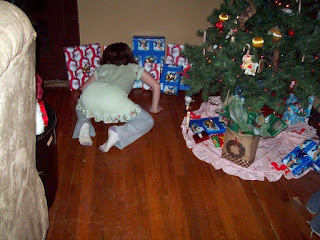 Little Miss is so into her gifts she didn't notice Mom taking pictures of her rear. Anyway, I want to wish all my SITS friends a joy filled holiday season. Enjoy your loved ones during this magical time of the year! Here is one of my favorite Christmas songs for you to enjoy! Thanks for stopping by to visit. You might want to check out my current giveaways over in my right sidebar and look around some. I look forward to meeting some more great bloggers through this SITSMAS card exchange. You can get in on the fun too, by heading over to SITS. It's a great group of wonderful gals! Merry SITSmas to you! I love the picture. I just hope no one does that to me. merry sitsmas! Thanks for introducing yourself! Your photo is PRICELESS! Don't ya just love Christmas morning, especially with kids?!? I LOVE it and I always have. I still wake my own kids up and my youngest is 15! LOL! Happy Holidays and a Merry SITSmas to you!!! Great picture! OMGosh I just love that photo of her! So funny and looks exactly like my kids reading the name tags every day on the same presents over and over trying to see if there are any new ones. Just love the holidays! Merry SITSmas to you. You have quite a lovely layout! Funny shot and Merry SITsmas! Merry SITSmas to you! Hope you have a great week! Merry SITSmas, thanks for visiting!! Merry SITSmas! That picture made me smile. I remember those days. Visting from SITS and now following. Great shot. Merry SITSmas and Merry Christmas! Such a cute photo! Hope you had a very merry SITSmas! Now why do moms do that? The rear shot I mean. One year at Christmas my mom took a shot of me playing Twister with my siblings. Unfortunately I was wearing a pair of hand me down green pants from my older sister. I didn't care that they were a little big, because they were green and I wanted to look like I was wearing Christmas colors. Well, needless to say I had to move on the twister mat some way that caused those pants to come down far enough in back with my behind up in the air that my mom saw the upper portion of my behind crack. Mom sure got a picture of that. What's worse the next day was Sunday and she showed it all around church and everyone was laughing at me. I was so embarassed. At least your daughter's rear end is covered. Mom's are we crazy about that area because it takes us back to when we diapered it. I don't know, do you? P.S. Someday your daughter just might find that shot in a photo album, grab it, and destroy it. I did mine. What a funny picture, I bet she just loves that. Merry SITSmas! I love the photo, I have a similar one with three noses under the tree.